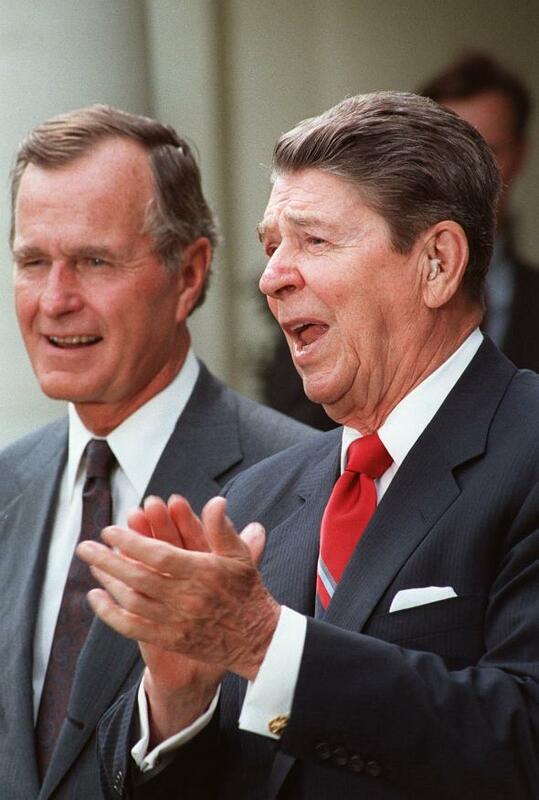 Reagan and Bush memos on climate change show Republican engagement. Former President Ronald Reagan and Vice President George H.W. Bush in the Rose Garden in Sept. 1987. A fascinating report by Joby Warrick of the Washington Post published Thursday shows a startling difference in the tone and rhetoric of the Republican party of the 1980s on environmental issues, including climate change, compared to the GOP candidates currently running for office. The Post obtained 11 confidential internal memos of the Reagan and elder Bush White Houses—obtained via the Freedom of Information Act—that showed consecutive Republican administrations far more concerned and engaged on the environmental issues than their current counterparts. It’s worth heading over to WaPo to read the piece in its entirety, but here are a few excerpts of the memos that show a remarkably different tone. Here’s an example from a State Dept. memo in Feb. 1989 in a newly inaugurated George H.W. Bush administration. In another memo sent to then-Secretary of State James A. Baker III in Feb. 1989, acting assistant secretary Richard J. Smith presented climate change as an opportunity for U.S. leadership. *Correction, Dec. 3, 2015: This post originally misstated the Washington Post report was published on Wednesday; it was released on Thursday.